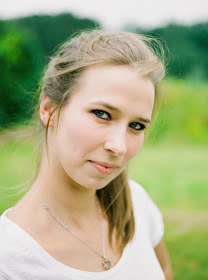 I'm Alicia, a cat-loving, crazy-cooking girl from Brussels, Belgium. I hope you enjoy my blog! If you have any questions, do contact me! I didn't know what to make for dinner last night. I remembered I saw some ramiro peppers at the supermarket the other day so I thought I'd do something with those. But the only stuffed ramiro recipes you tend to find are ones with just some mozzarella... and I needed more! So I came up with this while taking a shower (weirdly enough)... ramiro peppers stuffed with chicken, mango, avocado and goat's cheese. I also added some coriander to give it some extra flavour. These ingredients all went really well together, it is a light supper with lots of flavour and easy to prepare! a goat's cheese (Chevignol) - you can also use feta cheese if you like! First of all you need to grill the peppers slightly for about 10 minutes. I placed them in a grill pan on maximum heat and turned them around every couple of minutes. When the skin is blackened slightly, they should be done. When they are done, half them lengthwise an remove the seeds. If you are using bell peppers, you can follow the same instructions! Lay them out in an oven dish ready to be stuffed! Start with the cubed chicken, just place the cubes in the peppers raw, they will cook quickly in the oven! On top of the chicken, add the cubed mango, some coriander leaves and season. Season well, because chicken and avocado may become quite bland! Add a good amount of mashed avocado and some red onion on top of the mango and chicken. At this point you can also sprinkle the peppers with the paprika powder and garlic powder. In a bowl, mix the goat's cheese (or feta if using) and breadcrumbs together until it become a sort of paste with a dough-like consistency (feta will become more of a crumble). You can place bits of the "dough" all around on top of the peppers. These will form little crusts and will go great with the softness of the avocado, mango and chicken. Drizzle the entire dish with olive oil. Place the dish in the oven for about 30 minutes (make sure the chicken is cooked!) Serve with a salad or some baked potatoes. Hello, my name is Alicia! I am a cat loving amateur cook from Brussels who loves sharing food (unless it is on my plate).